Rising to the (Blogging) Challenge! How true! This quote has become somewhat of a mantra since my husband, John Latham, made it part of a presentation last year as part of our company’s 65th anniversary celebration. John used the quote in reference to how our family-owned seed company takes the road less traveled by remaining independent and offering a variety of product and program options for our farmer-customers. This particular Frost quote also is relevant to the people side of our business. Often times I meet some of the world’s nicest people while I’m visiting the smallest farming communities. I hear the most interesting stories while sitting in the buddy seat of a combine or across the table from a farm couple. These stories are what shape my blog, TheFieldPosition.com. 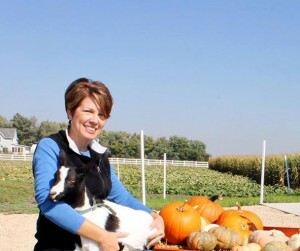 For the past five years, I’ve blogged in support of America’s family farmers. Often times I talk to industry experts and share their helpful agronomic tips. Other times I share recipes from meals I’ve enjoyed while visiting Midwest farmers. And when ridiculous laws or rule changes like those concerning Child Labor and School Lunches threaten our way of life, then I do what I can to give agriculture a voice. I’ve never been known to walk away from a challenge, so that’s why I’m joining Holly Spangler’s 30-days of blogging. The objective is for agriculturists to share what they do to help promote understanding among our non-ag friends. Get ready to agvocate! During this 30-day challenge, I will feature farm families and their favorite recipes on Fridays. I’m looking forward to “Slow Food Sundays” when I highlight recipes we’ve shared to bring families together for a healthy meal and a few hearty laughs. On Tuesdays, Larry Sailer will continue to post his “Musings of a Pig Farmer” blog. The rest of the days, I’ll address topics of interest to readers. Walk along the road less traveled with me! As Janice Person wrote, “While I want to do this daily, I also want them to keep readers by making them good enough to be read!” The best way to assure these topics are relevant and interesting is for you to send me your story ideas.